If you know someone who has trouble moving around or feeling pain and stiffness in his body, that person could have arthritis. In most cases, arthritis causes pain and swelling in the joints which eventually results to severe damage. Arthritis is not a single disease. This covers over hundreds of different medical conditions which can affect a wide range of age groups. It is the main cause of disability among elderly in industrialized countries. Arthritis came from the Greek work arthron- which means joint and Latin–itis which means inflammation. It is therefore defined as inflammation of one or more joints. There are many forms of arthritis. 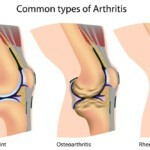 Osteoarthritis, a degenerative joint disease,is the most common form of arthritis which normally affects the elderly. Other forms include rheumatoid arthritis, autoimmune diseases, septic arthritis, psoriatic arthritis. For you to better understand what is going on with patients suffering from arthritis, you should understand first how joint works. A joint is a point where two bones meet allowing body movements. Ligaments are fibrous connective tissue keeping the bones in place. Cartilage covers the bone surface to prevent two bones from rubbing directly against each other allowing the joint to work smoothly and painlessly. Surrounding the joint is the capsule. The joint cavity which is the space inside the joint has synovial fluid. Synovial fluid is produced by the synovium which nourishes the joint and the cartilage. Depending on the type of arthritis you have, different factors could have contributed to joint damage. It could be daily tear and wear of the joint, a lack of fluid, autoimmunity, infection, genetic makeup, trauma or physical injury, muscle strains, obesity, allergic reactions or a combination of many factors. The major complaint by individuals who have arthritis is joint pain and stiffness, which typically worsen with age. Pain is usually constant and may be localized to the joint affected. Other signs and symptoms include swelling, redness and decreased range of motion. Some types of arthritis like rheumatoid arthritis and lupus can affect other organs in the body leading to variety of symptoms which include body malaise, fatigue, loss of appetite, poor sleep and stiffness. Extra-articular features include lymphadenopathy, ocular inflammation, cutaneous nodules, edema, cutaneous vasculitis lesions, diarrhea, bursitis, tenosynovitis, urethritis and orogenital ulceration. Risk factors include family history, age, obesity, previous trauma, and gender. Women are more likely than men to develop rheumatoid arthritis while men are more prone to have gout. This is the most common type of arthritis, often called “wear and tear” arthritis. In osteoarthritis, there is erosion of the cartilage resulting to bone rubbing directly on bone which causes severe pain and restriction of movements. OA is most commonly found in the knees (because they are primarily weight-bearing joints), hips, hands and fingers and spine. Heberden’s nodes are small bony swellings that develop on the distal (end) joints of the fingers. Bouchard’s nodes are small bony outgrowths that appear on the proximal(middle) joints of the fingers or toes.Other areas like the wrists, elbows, shoulders and ankles are less frequently affected by OA. When OA is found in these areas, there may have been a history of stress or trauma to that joint. Generally, this wear and tear arthritis comes on slowly, or it can be hastened by a joint injury or an infection. The most common sign is joint pain after physical work or exercise. As the disease progresses, one or combinations of these signs and symptoms will be noted: swelling and redness of one or more joints, stiffness after periods of inactivity (i.e. sleeping), flare ups of pain and inflammation after use of the affected area and crepitus (crunching feeling or sound of bone rubbing on bone when the joint is used). The exact cause of OA is unknown. Joint damage can be due to repetitive movement or can be as a result of direct injury. Some of the factors that may increase the risk of developing OA include age (strongest risk factor), gender, obesity, hereditary, joint alignment and sports. OA affects both men and women. However, before age 45, OA occurs more frequently in men while after age 45, OA is more common in women. Individuals with joints that don’t move or fit together correctly (i.e. dislocated hips, bowlegs) are more prone to develop OA. The diagnosis of OA is usually clinical. There is no definitive test to diagnose OA. Your physician will ask you about your symptoms and examine your joints to help determine if you have the condition. OA is suspected if you are 45 years of age or older, joint pain that gets worse the more you use your joints, no pain and stiffness in the morning, or stiffness that lasts less than 30 minutes. Diagnostic exams like x-rays are usually not necessary, however they may be used to rule out other possible causes of your symptoms such as a fractured bone. A series of x-rays obtained over time can show the progression of joint damage. X-rays of the affected joints can show, bone damage, cartilage loss, and bone spurs (extra bone growth that develop on the surface of normal bones). It is important to understand that there is no way to reverse the cartilage loss in OA. However, treatment options are available to help you alleviate the symptoms. The main treatments for OA include lifestyle modifications, medications and supportive therapies. In severe cases, where conservative measures have not been helpful, surgery to repair and strengthen or replace the damaged joints may also be considered. Lifestyle modifications include diet, losing weight and exercise. Being overweight often makes OA worse as it can add weights on your joints. If you are overweight, try to lose weight by eating a low fat diet rich in vegetables, fruits and lean proteins and do regular exercise. If your condition causes you pain and stiffness, you may think that exercise will make your symptoms worse. But on contrary, regular exercise keeps you active and mobile, building up muscles thereby strengthening the joints thus improving symptoms. Aerobic exercises such as walking, riding a bicycle, dancing, swimming will keep your heart healthy while controlling your weight. Strength-training exercises such as weight lifting strengthen the muscles for better support of the joints. Stretching exercises increase flexibility and relieve stiff joints. All these exercises improve your posture and relieve your stress, all of which will relieve the symptoms. Sometimes, medications are needed to control the symptoms. Analgesics can be given to help reduce pain. Examples are acetaminophen (i.e. Tylenol), tramadol and oxycodone. If pain is not controlled by taking paracetamol alone, your physician might add a stronger pain killer such as non-steroidal anti-inflammatory drugs (NSAIDS). These agents work by reducing inflammation. There are two types of NSAIDS. The traditional NSAIDS such as naproxen, ibuprofen and diclofenac and the COX-2 inhibitors such as celecoxib. If pain is so severe and cannot be controlled by both lifestyle modifications and oral medications, intra-articular injections of corticosteroids is also an option. Rheumatoid arthritis (RA) is a chronic, autoimmune, inflammatory, systemic disorder that normally affects the small joints in your hands and feet. Autoimmune disease is when your immune system doesn’t recognize your own body and targets your own body’s tissues. Patients with autoimmune diseases have antibodies and immune cells in their blood that attacks their own body tissues. This could be associated with inflammation. The inflammation around the joints is a characteristic feature of rheumatoid arthritis. However, the disease can also cause inflammation and injury to other organs of the body such as the skin, lungs, eyes, and blood vessels, hence, rheumatoid arthritis is sometimes called rheumatoid disease. While RA can occur at any age, it usually begins after age 40 and is more common in women than in men. Rheumatoid arthritis that begins below age of 16 is referred to as Juvenile Idiopathic Arthritis or Juvenile Rheumatoid Arthritis. 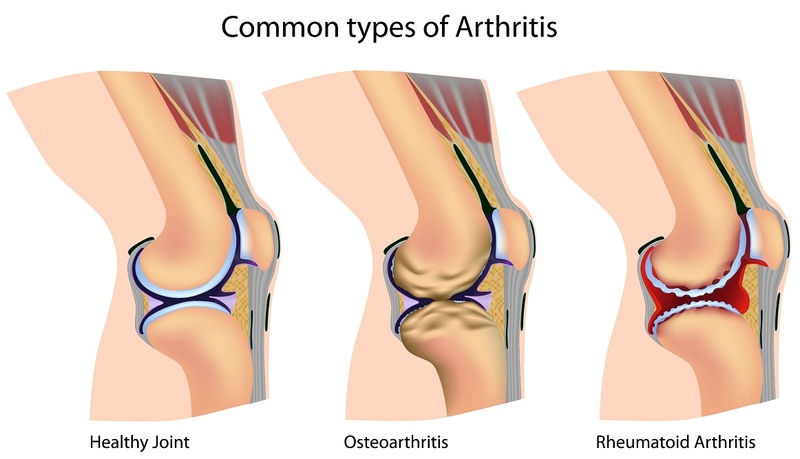 In contrast with the wear-and-tear damage of osteoarthritis, rheumatoid arthritis affects the lining of the joints (synovium) leading to a painful swelling that can result in bone erosion, joint deformity and loss of function.The tendons and ligaments that hold the joints together weaken and stretch losing its shape and its alignment gradually. The exact cause of RA is still not completely understood. There is no evidence that physical and emotional stress could trigger the disease. The process involves inflammatory, fibrosis and erosions of the capsule around the joints, underlying bone and cartilage. It can produce diffuse inflammation of the lungs, membrane of the lungs and heart and the whites of the eyes. RA can also cause nodular lesions on the skin. More than half of the risk for RA is believed to be hereditary. It is strongly linked with the inherited tissue type major histocompatibility complex or MHC antigen HLA-DRB1 (most specifically the shared epitope alleles, including *0401 and *0404), and the genes PTPN22 and PADI4. RA is also three times more common in smokers than non-smokers. Moderate alcoholic drinkers may be protective. No infectious agent has been consistently linked with RA. However, epidemiological studies have confirmed a potential association between RA and Epstein-Barr virus and Human Herpes Virus 6. Patients with RA are more likely to show an abnormal immune response to EBV and have higher levels of anti-EBV antibodies. The hallmark of RA is joint inflammation. This helps distinguish from the non-inflammatory form of arthritis, osteoarthritis. This is associated with redness, warmth, stiffness, pain and swelling of the joint/s affected, particularly following a prolonged inactivity. Morning stiffness is a prominent feature of RA and typically lasts for more than an hour. In non-inflammatory type of osteoarthritis, inflammation and early morning stiffness is less prominent, generally lasts less than an hour and movements aggravate pain. Generally, small joints are affected, however, any joint can be affected with RA: wrists, knees, shoulders, neck, feet, hips, cervical spine. Joints affected are usually in a symmetrical pattern, which means the same joint on both sides of the body, although this can present as asymmetrical at the beginning of the disease. As the disease progresses, multiple joints can be affected (polyarthritis). With time, the inflammation around the joints leads to tethering and erosions of the tendons and destruction of the joint surface resulting to limitation of movement and joint deformity. Fingers deformities include swan neck deformity; “Z-deformity”- hyperextension of interphalangeal joint fixed flexion and sublaxation of the metacarpophalangeal joint; ulnar deviation; and boutonniere deformity. In severe cases, mutilating deformities of the joints occur, known as arthritis mutilans. Not only the joints of the fingers, but other areas of the body can also be affected by RA which are all results of general process of inflammation, leading to ta a variety of symptoms which include body malaise, fatigue, loss of appetite, and muscle aches, which sometimes can be mistaken as flu, although they are usually less intense and lasts longer. Involvement of multiple areas of the body is more common with moderate to severe RA. A feature most characteristic of RA is rheumatoid nodule, a type of inflammatory reaction known as “necrotizing granuloma”. The typical rheumatoid nodule is a few millimeters to a few centimeters in diameter, sometimes painful, and is usually found over bony prominences, such as the elbow, the knuckles, the heel, or any other areas that is susceptible to repeated mechanical stress. These nodules are associated with a positive rheumatoid factor titer and severe erosive arthritis. Many forms of vasculitis occur in RA. Microinfarcts are benign forms of vasculitis seen around the nailfolds. Erythematous to purplish discoloration of the skin is a more severe form of vasculitis known as livedoreticularis which are caused by the presence of an obliterative cutaneous capillaropathy. The lungs, heart, eyes, kidneys, liver, and blood can also be affected by RA. They can be presented as shortness of breath, chest pain, episcleritis, renal amyloidosis, anemia and atherosclerosis leading to myocardial infarct. Rheumatoid arthritis is a clinical diagnosis. There is no single test that can clearly identify RA. The American College of Rheumatology uses the following criteria for the diagnosis of RA. Presence of four or more factors is diagnostic. The first four factors should be present for at least six weeks. Morning stiffness for at least an hour. Swelling or presence of fluid around three or more joints simultaneously. At least one swollen area in the finger, wrist, or hand. X-ray changes in the hands and wrists typical of RA, associated with destruction of bone around the involved joints. The goals of treatment for RA are to reduce inflammation, relieve symptoms, improve physical function and overall well-being, to prevent joint and organ damage and to reduce long term complications. There is no cure for RA. However, medications can help reduce inflammation in order to alleviate pain and slow down joint damage. Occupational and physical therapy can teach you how to protect your joints. For patients with permanent damage that limits daily function, surgical treatment is an option. There are two classes of drugs used in the treatment of RA. The first-line drugs or fast-acting drugs and the second-line drugs or slow-acting drugs. First-line drugs are used to reduce pain and inflammation. Drugs such as NSAIDS (e.g. ibuprofen, ketoprofen, naproxen sodium, and celecoxib) and costicosteroids (e.g. prednisone, prednisolone, methylprednisolone) are considered to be first-line drugs. Second-line drugs are used to slow down or stop the course of the disease and structural damage. These drugs includedisease-modifying antirheumatic drugs or DMARDS (e.g. methotrexate, hydroxycholorquine, sulfasalazine, cyclophosphamide, azathioprine, leflunomide); JAK inhibitors such as Tofacitinib block the Janus kinase or JAK pathways which are involved in the body’s immune response; biologics (e.g. abatacept, adalimumab, anakinra, infliximab, certolizumabpegol, etanercept, golimumab and rituximab) which block a specific step in the inflammation process. Abatacept blocks the activation of T cells. Rituximab blocks B cells. Tocilizumab blocks a cytokine called interleukin-6 (IL-6). Since these drugs work by targeting specific steps, they don’t wipe out the entire immune response. These can be given as infusion or injected. If your joints are severely damaged by RA, joint replacement therapy can help reduce pain and restore function. The procedure involves replacing damaged part of a joint with metal or plastic parts. Hip and knee replacements are most common. Gout is an inflammatory condition usually characterized by sudden, recurrent, severe attacks of redness, sharp pain, stiffness and swollen joints, often affecting the metatarsal-phalangeal joint at the base of the big toe. You can also get gout attacks in your foot, ankle, knees or other joints. It is a complex form of arthritis which is caused by elevated uric acids in the blood. The uric acid crystalizes, and these crystals deposit in the joints and surrounding tissues. Some people with high blood uric acid levels never get gout. But when the levels are too high, uric acid may form hard crystals in your joints causing pain. Long standing elevated uric acid levels may also result in tophi, a hard, painless deposits or uric acid crystals. Extensive tophi may lead to chronic arthritis due to bone erosion. It may also be presented as kidney stones or urate nephropathy. Although men and postmenopausal women are usually affected, this condition can affect anyone. The hallmark of gout is a nightmare attack of redness, swelling, tenderness and burning pain in your big toe (most common), ankle, knees or other joints. The attack is so painful often wakening you up in the middle of the night. The reason for attacks at night is due to lower body temperature. The attacks can last a few days or weeks before the pain goes away. Another attack may not occur for months or years. Normally, our body produces uric acid when it breaks down purines. Purines are substances that are present normally in our body, as well as in certain foods, such as organ meats, sea foods and steaks. Alcoholic beverages, especially beer, and sweetened fruit sugar also promote high levels of uric acid. Under normal conditions, uric acid dissolves in our blood and passes through the kidneys to be eliminated through urine. Uric acid builds up if your body produces too much uric acid or your kidneys excrete too little uric acid forming sharp, needle-like crystals in a joint or surrounding tissue that causes pain, swelling and inflammation. Your risks of getting gout is higher if you are fond of eating meat and fish that are high in purine and drinks too much alcohol. Some drugs also increase uric acid concentration, such as aspirin and diuretics. Major illness or certain medical conditions such as high blood pressure, rapid weight loss, obesity, diabetes, metabolic syndrome and surgery also increase blood uric acid levels. People born with rare conditions such as Kelley-Seegmiller syndrome or Lesch-Nyhan syndrome have a partial or complete deficiency in an enzyme that helps to control uric acid levels. Hyperuricemia is a classic feature of gout. However, gout can occur without hyperuricemiaand individuals with high uric acid levels do not have the signs and symptoms of gout. Hence, blood testing can sometimes be misleading. Hyperuricemia is defined as plasma urate level greater than 7.0 mg/dl or 420 μmol/l in males and 6.0 mg/dl or 360 μmol/l in females. Other tests include joint fluid test, x-ray imaging, ultrasound and dual energy CT scan. The goals of treatment are to settle the symptoms of acute attack and prevention of future gout attacks and long term complications. Options for acute treatment include NSAIDS, steroids and colchicine. Some evidence shows support on application of ice for 20-30 minutes several times a day reduces pain. Allopurinol and Febuxostat block uric acid production, limiting the amount of uric acid your makes, thus lowering your blood uric acid levels. Probenecid improves uric acid removal through the kidneys thus reducing your risk of gout. However, uric acid levels in your urine is elevated.